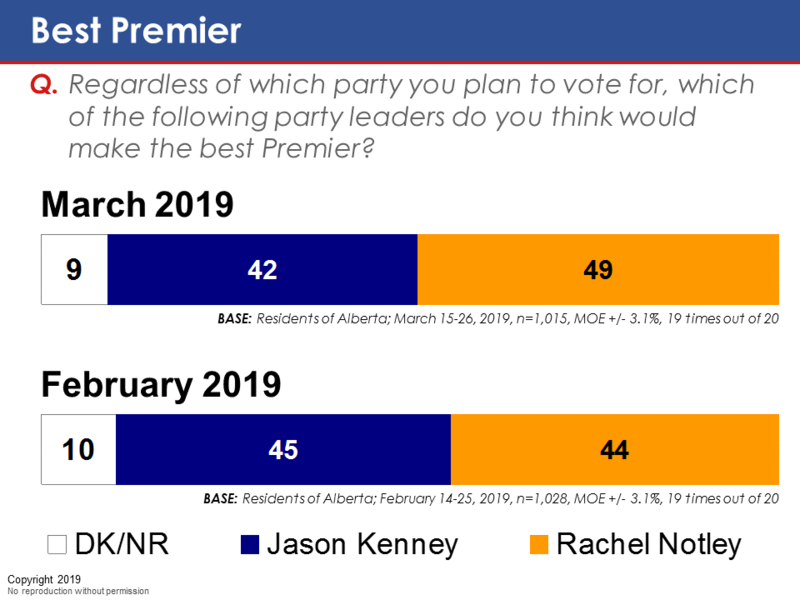 [Ottawa – March 31, 2019] With just over two weeks to go until Albertans head to the polls, incumbent Premier Rachel Notley is becoming more competitive. She has improved on some measures in the past couple of weeks, while Jason Kenny has gone down somewhat. 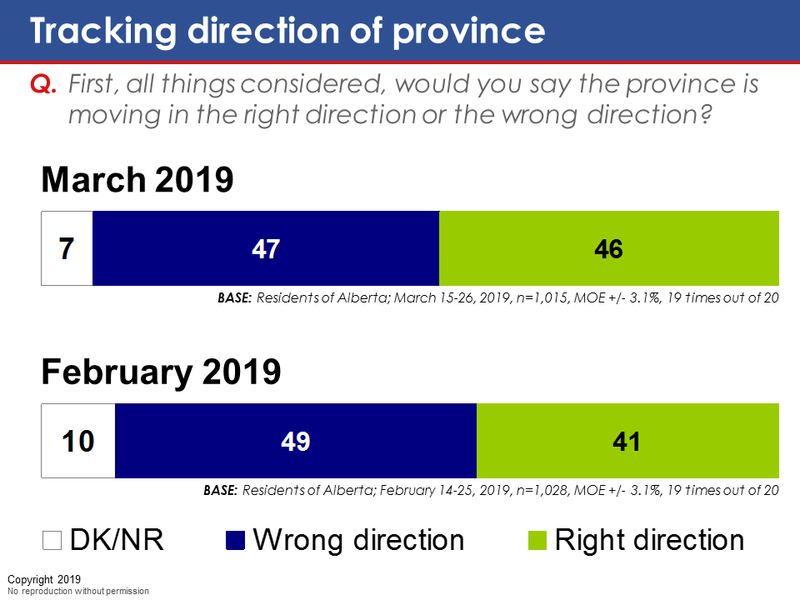 Most notably, about half of Albertans (46 per cent) now say the province is headed in the right direction, up five points since February. Furthermore, Rachel Notley is narrowly seen as the best Premier for the province. 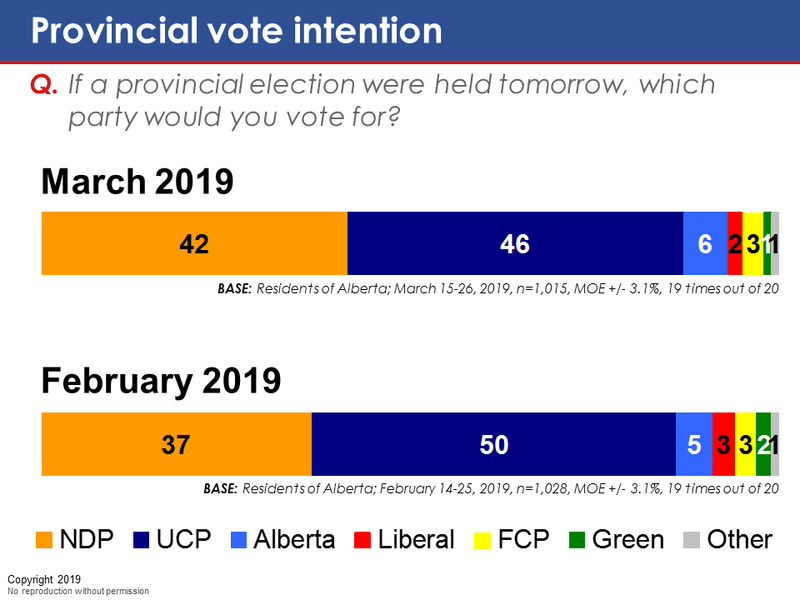 At 42 points, the NDP are still behind the United Conservative Party, but the results suggest the race is narrowing. The NDP leads in Edmonton, but trails outside the urban centres. 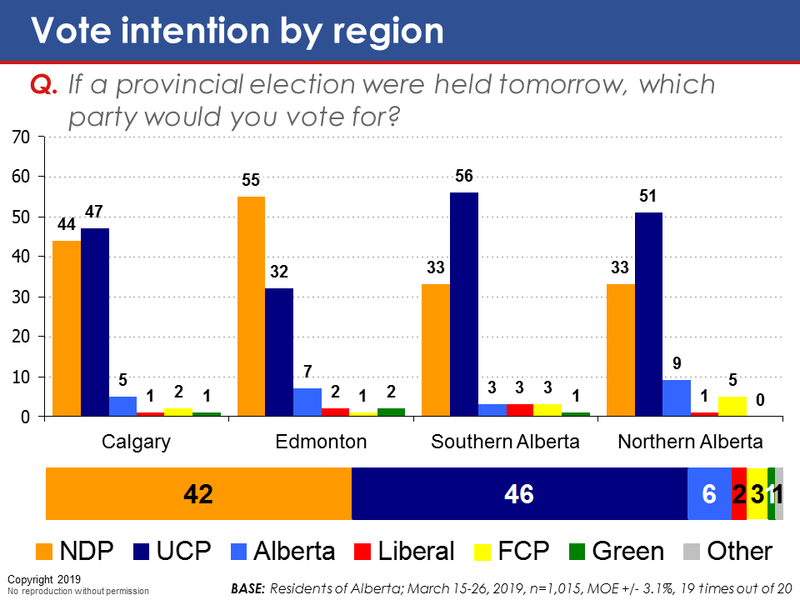 Calgary is a tight two-way race. This survey was conducted using EKOS’ unique, hybrid online/telephone research panel, Probit. Our panel offers exhaustive coverage of the Canadian population (i.e., Internet, phone, cell phone), random recruitment (in other words, participants are recruited randomly, they do not opt themselves into our panel), and equal probability sampling. All respondents to our panel are recruited by telephone using random digit dialling and are confirmed by live interviewers. Unlike opt-in online panels, Probit supports margin of error estimates. We believe this to be the only probability-based online panel in Canada. The field dates for this survey are March 15-26, 2019. In total, a random sample of 1,015 Alberta residents aged 18 and over responded to the survey (200 by phone, 815 online). The margin of error associated with the total sample is +/- 3.1 percentage points, 19 times out of 20. Please note that the margin of error increases when the results are sub-divided (i.e., error margins for sub-groups such as region, gender, age, education). All the data have been statistically weighted by age, gender, and educational attainment to ensure the sample’s composition reflects that of the actual population of Alberta according to Census data. Truly a random sample poll unlike so many others. Random sampling least biased such that results more accurately reflect the general population. It confirms my thought that women, the educated and those less than 44 years are the key demographics for Notley’s NDP to be re-elected. More need to realize Kenney’s need to balance the budget means $10 billion removed from classrooms and health. THESE two departments account for 55% of the budget. A $10 billion or 20% cut must mean education and health care education cuts. This will be devastating for students who will be sitting in huge classrooms but also for all who are waiting for operations.